Several weeks ago I decided to do a late planting of some greens for a late fall harvest. 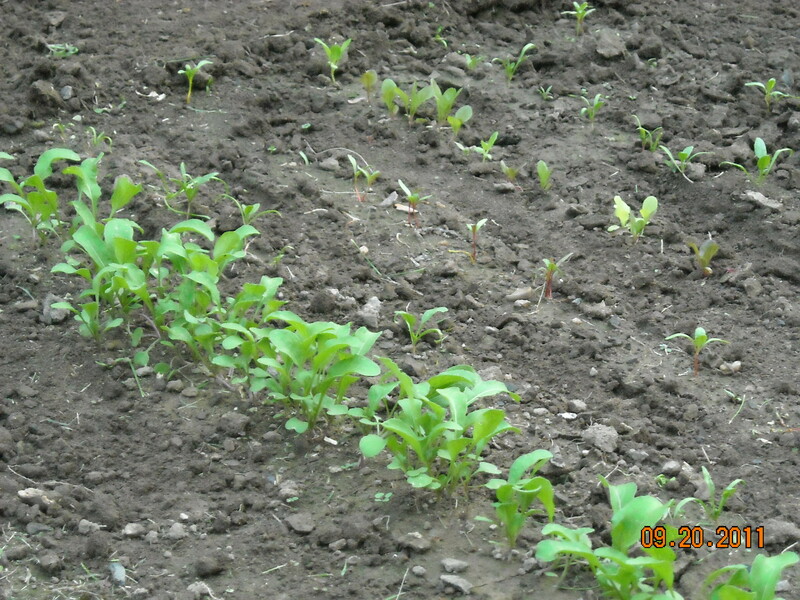 I planted: swiss chard, spinach, arugula and two types of lettuce mix. I also planted some old green onion seeds as a test, but the seeds must have been too old because none of the seeds germinated. Right now the arugula looks the best. This was even after a week of record-breaking rain in the northeast 2 weeks ago, we still have a lot of seedlings doing well. In order to protect the seedlings from the hard rain I had covered the cage with a plastic-backed drop cloth, this helped slow down the hard rain. It also helped deflect some of the rain which kept the seedlings from washing out. 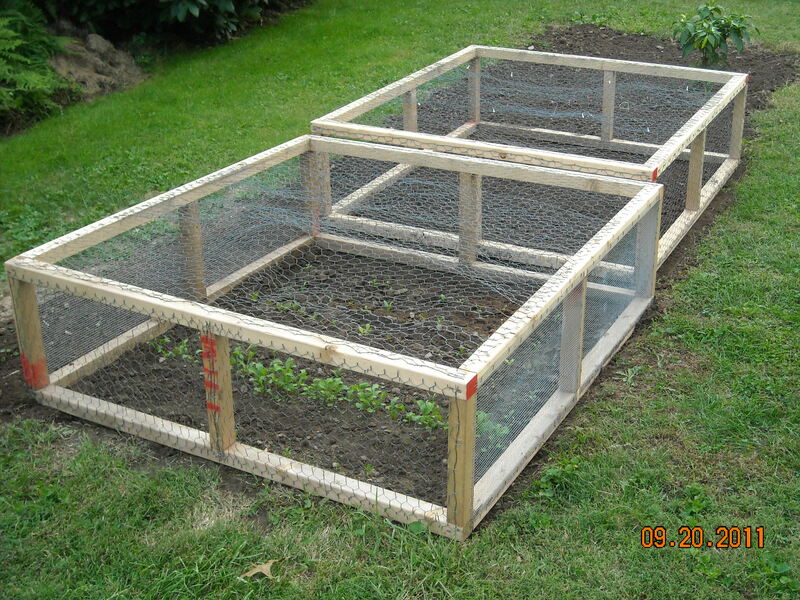 Last spring the rabbits quickly ate all my greens, as a result I decided to build two 4′ x 4′ x 14″ high cages to keep the rabbits out. After years of working in a garden that was surrounded by a chicken wire fence, I was tired of stepping and tripping over fencing. Making these simple cages seemed like an easy way to keep out the critters and allow easy access to working in the garden. The cage also helped make it easy to cover the seedlings from the hard rain. Lets just hope the rabbits don’t try going under the cages. It’s Nothing New, It’s Just Old Fashion??? Welcome to the first posting on The Year Round Harvest. For my first post I thought it might be interesting to explain the statement “It’s Nothing New, It’s Just Old Fashion”. When I began gardening several years ago I had three key sources for knowledge; my father, my grandfather and books. Early in my gardening experience my father and grandfather gave me lots of advice on the various aspects of gardening. It was my grandfather who introduced me to the concept of organic gardening. But even with this wealth of family knowledge I felt I had to learn something for myself. So I turned to books and magazines. I started reading everything I could on gardening and farming, trying to learn all the latest ideas and concepts. After I would complete a book or read an article in a magazine I would go across town and tell my grandfather about it. Each conversation usually started the same way; I would tell him about the latest concept I had just read about and he would respond by saying “Yes, that’s how we did it years ago”. Sometimes he would even tell me stories about how my great-great grandmother would do it. We would discuss the topics in-depth, sometimes talking for hours. These are the moments I will never forget. After this happened a few times, I began to realize something, everything that I thought was new was actually just the way it was done years ago. The only reason these ideas seemed new to me was because they had not been discussed in so many years. The reality is Its Nothing New, Its Just Old Fashion. Just remember our parents, grandparents or even great-grandparents are a great resource for information about growing and preserving food for a year round harvest. They had to do did it for survival, we get to do it for fun.